Did you know that 81% of businesses are using video in their marketing RIGHT NOW? 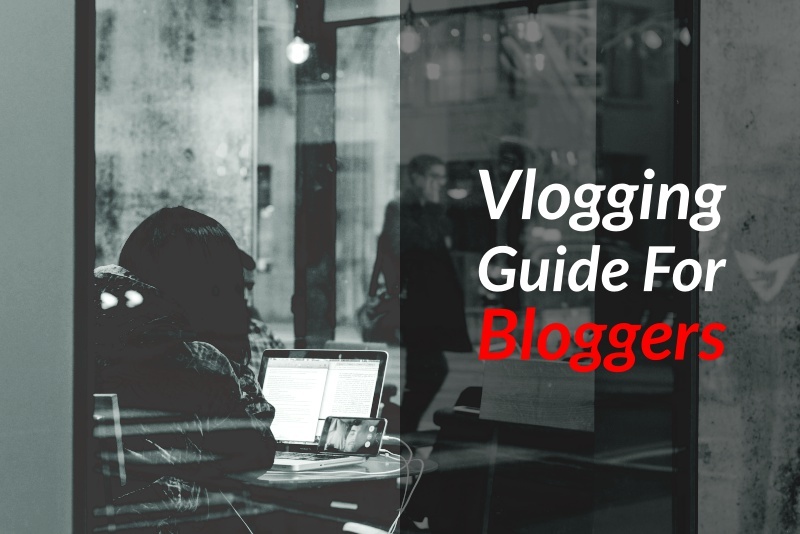 In this post, you’ll discover how you can harness the power of vlogging, and YouTube to promote your blog content to a whole new audience, thus exploding the growth and profitability of your blogging business. Chances are you probably have, but if you haven’t, let me briefly explain to you what vlogging is. Vlogging is very much like blogging, but instead of creating content in written text form, you’re simply recording content in the form of videos. That’s as simple as I can put it, and some people call it ‘video blogging’ or video journaling, or just video marketing. A ‘vlogger’, is someone similar to a blogger. An individual who creates videos known as vlogs or ‘video blogs’. Whereas blog posts are published on self-hosted platforms, vlogs, on the other hand, are published on sites like Facebook, Vimeo, and YouTube. YouTube, however, is by far the most prominent place on the web where vloggers publish their vlogs. YouTube is huge, in fact, it is considered to be the second largest search engine on the web. Over the recent years, vlogging on YouTube has exploded, and not just for the celebrities and rich kids, but also for businesses and bloggers too. With more people consuming content on mobile devices, online video is the perfect medium to use to help promote your blog or your online business. In fact, according to Vlogging Guides, YouTube accounts for 80% of the total mobile video consumption. So it’s clear to see that if you’re not vlogging, then you’re clearly missing out on a huge opportunity to increase your brand awareness, drive more visitors, create more leads, attract more customers and clients to your blog or online business. Well, it’s time to change your gameplan! Are you ready to start vlogging to explode the growth of your blogging business? If you are then let’s begin. Getting your YouTube channel geared up! Let’s start with your YouTube channel. I would be very surprised if you didn’t as a blogger. Perhaps you do have one and haven’t really made much effort to put it to good use. If you have a YouTube channel, it’s time to light a fire on it. If you don’t have one, click here to create one. Your YouTube channel is personal to you. It’s your gateway to broadcasting yourself, your brand and for increasing awareness for almost anything you want on the web. But let’s be smart about this, because as a blogger, you should view your YouTube channel as an additional platform in which to create, share and promote great content on. With a blog, you publish blog posts, right? With your YouTube channel, you publish vlogs or videos. The other great thing about publishing content on YouTube is that it has a humongous community waiting for you. That’s right, whatever niche you’re into, chances are there are folks on YouTube searching for exactly what you have to offer them right now. So, not only do you have the opportunity to add and share great content, but also the opportunity to grow a huge fan base, a loyal following known as ‘subscribers’. OK. Before you even start thinking about creating channel and uploading your videos or vlogs of any kind, you first need to make your channel look smart, professional and appealing to your target audience. 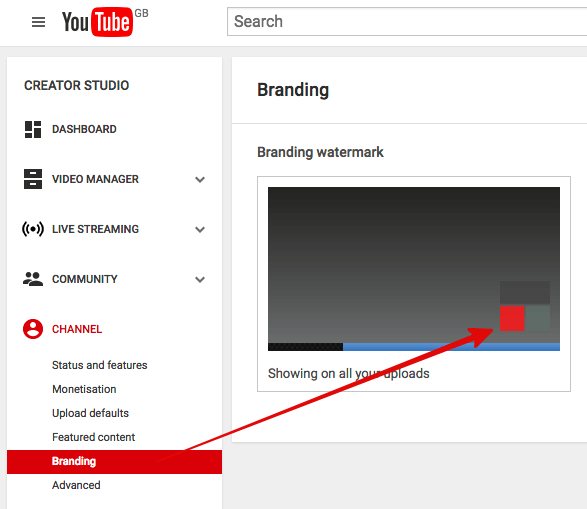 What does ‘branding your YouTube channel’ actually mean? Come one, I’m sure you know. It means to give it some kind of identity that will help people recognize who you are, similar to that of your blog or website. In fact, very much like your blog. If you have a unique appearance or identity for your website or blog, then you should naturally carry that identity over to your YouTube channel. In other words, be consistent with your online branding. And when I say branding I don’t just mean making your channel look like your blog or website, but you also have to pay attention to your marketing message, byline, about page etc. If you take a look at my YouTube channel, for instance, you will notice that my branding and messaging is consistent with that of my website and video landing page. Take some time to craft a great banner logo for your channel, as well as create some cool thumbnail templates which you can use later on in your vlogs. These will help anyone who knows you through your blog, to identify your content and channel on YouTube. If you need help with custom YouTube graphics click this link to see how I can help you. As well as branding, don’t forget to customize and complete your channel profile and settings too. The idea is to use your channel to not only promote your vlogs and videos, but to also drive visitors back to your blog to consume your content, and subscribe to your email newsletter. Write a short but powerful description in the about section. Add customized links to important pages on your blog or website. Brand your videos with your logo using branding watermark. Add your associated website under advanced settings. Add channel keywords under advanced settings. Creating vlogs or videos for your channel takes as much time and effort as creating any other type of online content. With blogging, you can spend days or weeks researching, writing and crafting your blog posts to perfection. Vlogging is very similar, however as a blogger creating videos, you have a huge, huge advantage. That advantage is that you already have content to use in your videos. I’m talking about using content on your blog. Repurposing content from your blog and turning them into vlogs cuts your workload right in half. And this is one of the many reasons vlogging can be so powerful for bloggers. Remember though, the content you use for your vlogs needs to be of high-quality too. The recording and audio quality of your vlogs also need to be top-notch. It doesn’t need to be perfect, but good. Let’s now look at the process of creating high-quality vlogs for your YouTube channel. Start with making a list of all the blog posts that you have on your blog that could potentially be repurposed into vlogs or videos. Tutorial posts and product review posts are great for doing just that. However, with careful planning, you can also turn your list posts and even strategy posts into vlogs too. Always keep in mind two things ‘quality’, and ‘relevancy’. After making your list, take each post and begin restructuring them and reorganizing the content so that they can be reproduced into a quality video. End the video with a call-to-action, for instance, asking viewers to visit your blog URL for more of what you have to offer, or to subscribe to your channel. This is very important if you want to drive traffic from your vlogs. Add an outro and end credits. The next step is to actually record your vlogs (videos). Now, this step can take a considerable amount of time to do, especially if you’ve never done anything like this before. If you make mistakes at first, that’s OK. Don’t become frustrated with it and give up. Making mistakes is all part of the process. Just take your time and try and have some fun doing it, you’ll soon get the hang of it. If you’re doing online tutorials and need a reliable screen recording software, I highly recommend using Screencast-O-Matic. Screencast-O-Matic has some really cool features and even though it’s a premium service, it’s very affordable, like $15 or so per year. If you’re recording yourself in your vlogs, then you will need some kind of HD video recording device. I started off using my Smartphone for recording HD video and audio. In fact, smartphones are one of the best tools you can use for the job because most of them have quality video recording cameras built-in. Only because the video clips are saved directly onto my hard drive. Editing your videos can take just as much time as it takes to record them, but take your time. The more you practice the quicker you’ll become at editing. One important tip I can give you when editing is this – don’t be overly-critical with your video edits. You’re not trying to edit a Hollywood Motion Picture, you’re simply polishing up your YouTube vlogs. 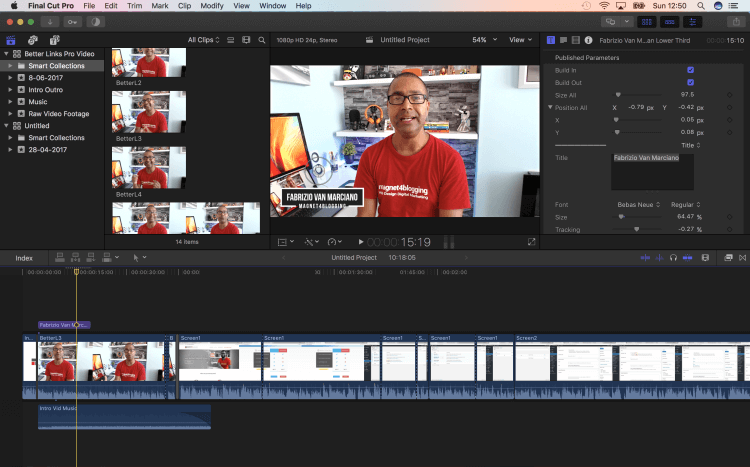 For editing your vlogs and making them look clean and semi-professional, I recommend using something like Movavi for Windows or Mac. It’s a free video editing tool, and you’ll love using it. I was using Movavi before moving over to Final Cut Pro for the Mac early this year. Tip: Export your vlogs in a recognizable format by YouTube and always aim for the best quality possible. Of course, you don’t really need to go and spend a ton of money on expensive video editing software’s, unless you’re going to be vlogging on a professional level that is. If you have some video editing tools on your computer, just use that for the time being. Once your vlogs are ready and polished up, simply head over to your YouTube channel to begin uploading them. Check out the video below by Brian Dean from Backlinko on YouTube SEO. Creating vlogs is one challenge in itself, the other is using them to help drive traffic and readers to your blog. Give your vlogs a relevant click-worthy headline title. Don’t use misleading titles, just describe what your video blog is about. Don’t forget to include the keyword in your title. Add a good description. In the description don’t just add a link to your blog and be done with it. Instead, also add a good description of what the content of your video is about. Again, make sure you use the exact match keyword of your video in the description. Use suitable tags to help viewers find your videos in YouTube and Google search. Use custom branded thumbnail graphics for your vlogs. Add the video title in your image too. Set goals in Google Analytics to track clicks and conversions. Use YouTube analytics to fine tune your marketing and video promotion strategy. Check out the video below to learn how to use YouTube Analytics. Promoting your vlogs for increased views and traffic! Like any other online content promotion, your vlogs needs some exposure in order to get views and traffic, so the best way to do this is to promote them along with your YouTube channel. The more people that subscribe to your channel, the more chances you’ll have at promoting your new vlogs to those subscribers. More content, more traffic, more referral traffic to your blog, and so forth. Here are 10 things you can do to promote both your vlogs and your YouTube channel. Embed your vlogs into all relevant blog posts. 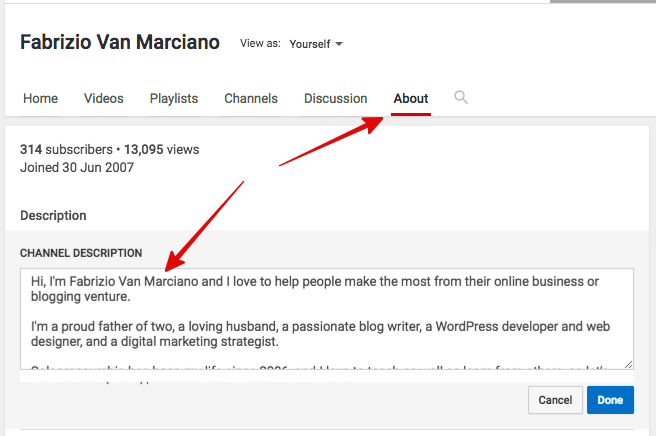 Add a link to your YouTube channel from your blog’s main navigational menu. Share your vlogs on your Facebook page. Mention your YouTube channel when you do your Facebook Live or Periscope broadcasts. Tweet your latest vlogs on Twitter regularly. Promote your latest vlogs to your email list. Create short videos on Facebook to promote the full-length versions of your vlogs on YouTube. Engage with your subscribers and commenters. Share your videos on your other social media platforms. Create short videos on Instagram to promote your YouTube videos. For more pro tips on growing your YouTube audience, check out this post. OK. So to give you some inspiration to get started, below I’ve compiled a very short list of my favorite bloggers that have found success with vlogging. Ileane Smith from IleaneSmith.com – I’ve known Ileane for a number of years now and through her YouTube channel she vlogs about blogging and social media, as well as provides YouTube tutorials. Check out her channel here. Ashley Faulkes from Madlemmings.com – Again I’ve known Ashley for a number of years. 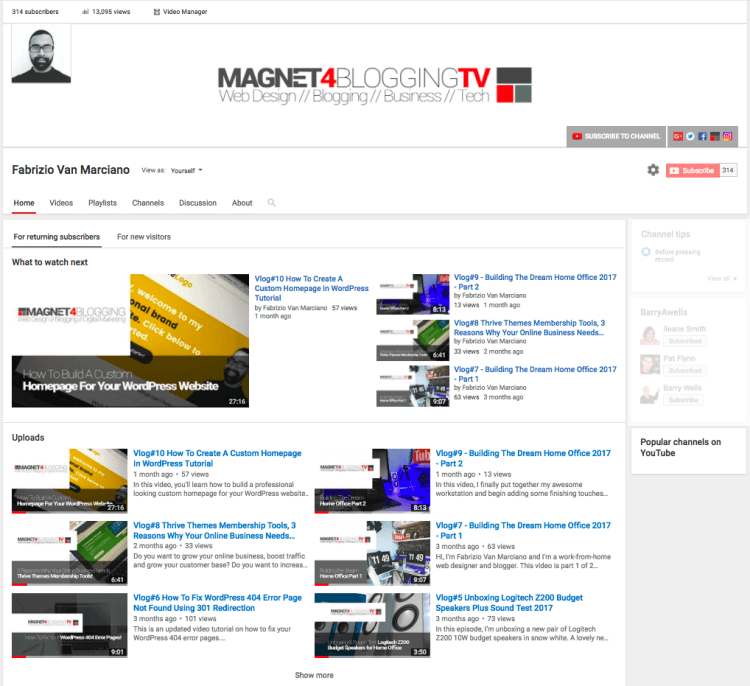 Through his YouTube channel, Ashley provides WordPress and SEO tips and tutorials. Check out Ashley’s channel here. Justin Germino from DragonBlogger.com – Justin is a technology and entertainment blogger and vlogger who’s been around for a very long time. I had the pleasure to interview him a few years ago too. You can check out Justin’s channel here. Alessandro Castellani from Alecaddd.com – Alessandro is a professional web designer and developer blogger and vlogger which I’ve been following for a few years now. Most of what I know about WordPress web design and development I learned from watching Alessandro’s vlogs and tutorials. You can check out his channel here. So, there you have it! Some key things you need to know to start vlogging to grow your blog the smart way. I realize that vlogging can be an extremely time-consuming activity, but as you get more used to doing it, the more fun you’ll have, and the better you’ll become at it and the more rewarding it will be. Once again, video can be a very powerful medium, so make sure you’re doing everything you can to make it work for you and your blog or your online business. There’s a whole new audience out there waiting to discover your content through video and vlogging, so go make something happen. Are you creating videos to promote your blog or online business? If you enjoyed this post, please share with will all your friend and connections on social media, I appreciate you as always. Ps. Don’t forget you can check out my vlogs and videos through my YouTube channel here, feel free to subscribe if you love what I have to share. Hi Ryan, thanks for dropping by mate. Glad you share my strong feelings about creating amazing titles for videos. Hey mate, you know too well how vitally important video content is for promoting your brand and how to use it to reach out to your audiences. Keep crushing it my friend, we want to hear more of your top blogging tips and travel tales, with those incredible paradise backdrops! Have a great week ahead buddy.